Most people who live in San Diego have a bit of an obsession with fish tacos and will become passionate when discussing what makes a high-quality fish taco and -- perhaps most importantly -- where to go to find such a taco in San Diego. For us, the sauce is a deal breaker for which fish tacos we love or simply like, followed by the kind of fish and how it is prepared. We have three go-to places for fish tacos and we are excited to share them with you today. Each is a little bit different in how the taco is prepared and what type of ambiance the eatery has, meaning a fish taco for different moods and cravings. South Beach Bar and Grille is the crown jewel of San Diego fish taco shops…disguised as a dive bar…if, you can call it a dive bar since it has wide ocean views thanks to waves lapping the sand right across the street. The dichotomy of South Beach is what makes it such a fun, beloved place to get fish tacos. Not only are the fish tacos mouthwateringly tasty and chock full of high-quality ingredients, but it’s also a fun, laidback atmosphere in which to enjoy your meal and maybe even catch the sunset. South Beach Bar and Grille is located in Ocean Beach and was recently remodeled, but retains its chill, beachfront charm with a wide wooden bar next to the front windows that is the ideal place to grab a seat if there is one free. South Beach has a wait for tables most nights and you seat yourself. Don’t be shy about asking if you can join in on one of the larger tables if there are a few empty chairs. You might make some new friends and you’ll get your tacos faster. After you’re seated, flag down one of the servers to come to take your order. There is a 21+ room upstairs that also has ocean views and some al fresco balcony dining. While waiting for a table, you can enjoy a local craft beer from the tap or get a cocktail from the full bar; then sidle as close to the window as you can to get a view of the rushing waves and Oceanside Pier. South Beach has a large variety of fish tacos that fall into two main categories: grilled or fried. For grilled, options are mahi, wahoo, albacore, shrimp, shark, lobster and ceviche. Fried tacos include Baja made from pollock fish meat (a South Beach favorite), oyster, calamari, and shrimp. Each taco comes with cheese, cabbage, salsa fresca and the most important ingredient – the white sauce that is South Beach’s secret recipe. All the ingredients are served on a flour tortilla or you can request corn. The happy hour menu is extremely popular in South Beach since it includes a Mahi, wahoo, Baja or carne asada taco for just $2.95. On Taco Tuesday and Taco Thursday, you can get any taco during happy hour for $2.95 (except the lobster taco). South Beach also has a kids menu – which is something new since the establishment used to be strictly 21 or over, but kids are now welcome on the bottom level. Though the kid menu has fish and chips, it doesn’t have fish tacos, and in my experience kids love fish tacos, so get them the Baja style one and see if they’ll try a fish taco -– they might surprise everyone, including themselves, and be a huge fan! Hours: Open Daily 11 a.m. to 2 a.m. (21+ only after 6 p.m.); Happy Hour is from 3 p.m. to 6 p.m. Monday through Friday. The Fish Shop has two locations, one in the San Diego beach neighborhood of Pacific Beach (PB) and another up in North County San Diego in the coastal city of Encinitas. Being located in two of the most surfer-friendly communities in San Diego County has seemingly influenced the vibe inside the Fish Shop, which has wooden tables with beautiful finishes, partially covered patios with a bar area, and laidback indoor dining areas accented with colors of the sea. One thing the Fish Shop isn’t laidback about is the quality of its fish, which you can get in a plain, sandwich, or – our favorite – taco form. The Fish Shop gives you a bit more control over your fish taco then other establishments in San Diego. It has a 3-step ordering process, which you conduct at the counter (be warned there is usually a long line during peak dining hours) and gets a ticket number to place on your table. During the first step, you’ll pick your fish. The Fish Shop has a ton of choices, including seared rare ahi, shark, local halibut, albacore, shrimp, scallops, lobster, red snapper, sea bass, salmon and my two favorites – yellowtail and swordfish. The next step is to choose a marinade. This deviates from the fish taco norm since most places in San Diego automatically put a white sauce on the taco. At the Fish Shop, you still have their signature white sauce option or you can choose from several others, including blackened or fish shop seasoning, chipotle glaze, lemon butter, salt and pepper, teriyaki sauce or garlic butter. Our favorites are the white sauce and the garlic butter. The last step is to choose the style you want it prepared, and as we mentioned before, we think taco is the way to go (salad, sandwich or plated are the other options). If the ordering steps seem overwhelming, you can make it easy on yourself and just order the TKO Taco, which I’ve had before and like a lot, though it has a bit of a spicy kick to it I wasn’t expecting. 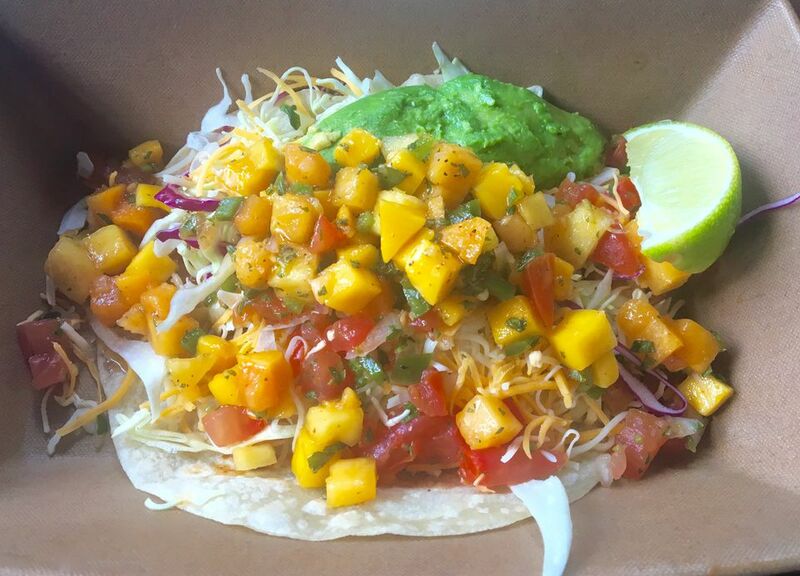 The TKO Taco has Mahi fish, cheese, cabbage, avocado, white sauce, and a tropical salsa that has a mango flavor to it. Though tell your vacation days to beware – the TKO Taco may cause you to book a flight to Hawaii immediately after eating it. Hours: Open Daily 11 a.m. 10 p.m. Hours: Sunday through Wednesday 11 a.m. to 9 p.m.; Thursday through Saturday, 11 a.m. to 10 p.m.
Brigantine’s will feel like the ritzy place to get your fish taco fix thanks to its views of the Del Mar Racetrack, valet parking, oyster bar and proximity to the beach. Inside though, you’ll find an upbeat, but relaxing atmosphere with both a main dining area and bar section. You’ll get friendly table service at each. Brigantine’s doesn’t give you a lot of options when it comes to fish tacos and that’s just fine because its Baja fish taco stands proud as one of the best fish tacos in San Diego. In fact, the official menu name of the taco is “The Brig’s Famous Fish Tacos.” Enough said. But…we'll say a bit more on Brigantine's fish taco and why it's so famous. The fish is fried in the classic Baja style but is not overly breaded or cooked, so it’s still moist and fresh tasting. On top of the delectable fish is a hefty sprinkling of cheddar cheese, cabbage, salsa fresca, and a creamy housemade ranch dressing. The cheddar and ranch (instead of tangy white sauce) make it differ from a classic fish taco, but it’s so good most people don’t care. Brigantine's also has a spicy grilled swordfish taco, if you want to deviate from the popular fish taco route while eating at the establishment. Also, if in North County San Diego, Brigantine's sister restaurant in Carlsbad, Miguel's Cocina, has a similar taco to the Brigantine's famous one on the menu. Hours: Lunch: Monday through Saturday, 11:30 a.m. to 2:30 p.m. and Brunch on Sunday from 10:30 a.m. to 2:30 p.m. Dinner: Sunday through Thursday, 5 p.m. to 8:30 p.m.; Friday through Saturday, 5 p.m. to 9 p.m.
Other Locations: In addition to the flagship Del Mar location, Brigantine’s has locations all over San Diego County, including in Coronado, Escondido, Point Loma, La Mesa, and Poway. That rounds up our list of my favorite fish taco restaurants in San Diego, ranging from classic preparation to more creative, and grilled heartiness to fried bliss. Did we include any of your favorite fish tacos?